Here is the recipe for the vegetable soup that we can, I have gotten some requests for it. My Mom used to make a lot of it, and it’s really good. The recipe made absolutely no sense to me, so I re-wrote it with the help of my Mom. Women seemed to have no problem making sense of it, but it was way to vague for me. It was basically “cut up some vegetables, boil, and can.” I need more specifics than that. Anyway, here it is. Cook hamburger with seasoning, drain. Parboil each vegetable separately, with salt. Drain vegetables and mix together all ingredients in a giant cauldron (alphabet macaroni can be added uncooked). Add more seasoning if desired (salt, onion salt, celery salt, bouillon, pepper, etc.). 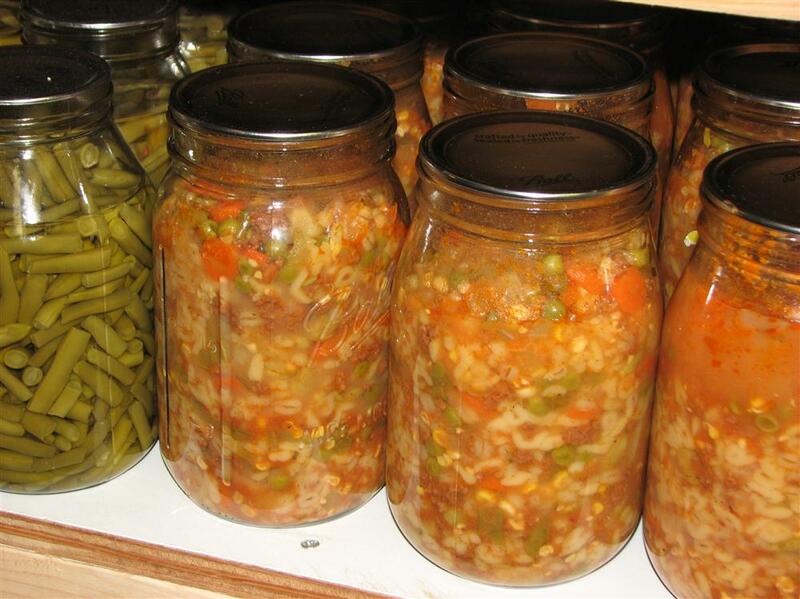 Ladle into canning jars and process in pressure cooker at 10 lbs for 90 minutes (quart jars). It could be frozen instead if you prefer. To serve, add 1 quart of either tomato soup, tomato juice, or beef/chicken broth to 1 quart of soup. Add more seasoning if needed. Note: If you don’t have a giant cauldron, sterilize a big plastic tote and use that.